Do Peppered Moths Prove Beyond Any Doubt Darwin's Theory? Moths aren't just pests of course. They're an important part of the eco-system, pollinating flowers and helping with the seed production, while also being a food source for birds and bats. 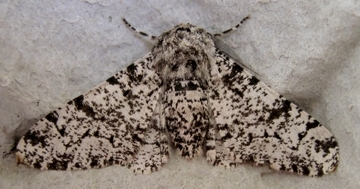 Throughout the centuries, this moth was observed to have a light color with small dark spots (pepper) 98% of the time. The other 2% possessed a dark color; same moth; two colors; all interfertile; all one species. The peppered group was well camouflaged from birds by the lichen-covered tree trunks. In the 1800s, the industrial revolution brought air pollution and soot which killed the light-colored lichen, exposing the dark tree trunks. Now, so the story goes, the light-colored moths easily were seen by birds, while the dark moths were camouflaged better. The dark group survived and reproduced over 90% of the total population. Now that the environment is being cleaned up, the lichens are resuming, and the percentage of light moths is increasing proportionately. "These data provide the most direct evidence yet to implicate camouflage and bird predation as the overriding explanation for the rise and fall of melanism in moths," the authors wrote in the abstract. I personally find it fascinating just how fast nature can adapt to the environment in order to survive.